Rider Carlos sent us a documentary he found on YouTube about a Muni driver. It was none other than Tammy, who held a great party on the 33-Stanyan for her riders (see Greg’s post about Tammy in May). “The Front Seat — A documentary about San Francisco Muni Bus Drivers” was made by Sara Biegelsen at Digital Video Workshops. In it, Tammy talks about why she takes her job so seriously: “All these people on my bus, I’m responsible. Their lives are in my hands. You can’t put a price on that.” She also explains how drivers sometimes have to adjust their mood based on the line they’re driving. Thanks, Carlos, for the tip. And thank you, Tammy, for your amazing attitude. It’s great to see you in motion. From smallerdemon, just another of the 1,000s of ways Europe kicks our asses. This reminds us of Muni operator Tammy, who showed her appreciation for her 33-Stanyan passengers by throwing bus parties her last couple of days driving that route. Any 24-Divisadero riders out there get to meet Tammy yet? NextMuni.com says my bus arrives in 18 minutes and the next one comes in 32 minutes. Next I check it’s 9 minutes and 23. Then the ETA jumps up to 12/18…then 13/16…and finally 4/4. By the time I get to my stop, both buses are pulling in together. 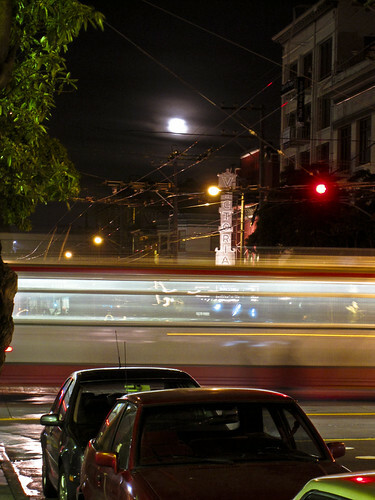 Just another typical morning waiting for the 33 in Upper Haight. As I sit in the bus watching new passengers board, I witness a Muni miracle: a sea of frowns turn into big grins as people enter and see what awaits them. I overhear nearly every newcomer commenting on the scene to either Tammy or their fellow straphangers. “How cool is this,” they ponder aloud. “Is this for Mother’s day?” “Is someone retiring?” “I can’t believe I got candy.” Even the woman on her cell phone discussing how her doctor just found a lump in her breast seemed upbeat, enjoying her Tootsie-Roll lollipop with her lips curled up from ear to ear. Rider Dave Rhodes wrote MTA a letter about two Muni drivers who saved the day when Dave’s wife lost her wallet on the bus. I’d like to voice my appreciation for two fantastic San Francisco Muni drivers, George and Bernetta. My wife and I had just purchased two Muni passes on March 2nd for the first time, having recently returned to this city after many years. We were on our way home from the Haight district and took the #33 from Haight St. up to Fulton and Stanyon to catch the #5 to Fulton and 25th. We were shown the number to call for assistance and my wife hooked up with a very helpful operator who’s name I don’t know. She was told that the driver of the #33 (George) would be contacted and asked to look for the wallet. While my wife was on a cell phone talking to the operator, Bernetta also called from her bus radio or phone to try and get the other driver to locate the wallet as soon as possible. We all knew that time was important, given the increasing likelihood that some nefarious character would find it before the driver did and help themselves to it. After we reached our destination and disembarked, the MTA operator called back to say that the wallet had been located and that we’d be able to claim it from the #33 driver when he came around again. We were given a time to meet him and grabbed another #5 going back to Fulton and Stanyan to wait for him. When George pulled up he was beaming, and said that he was happy to have found the wallet because so many items are lost or stolen, he was glad to see something have a happy ending. My wife had ID in the wallet so George was careful to make sure it was hers and then he happily handed it over – a check of the contents showed that the newly purchased Muni pass was still in there, along with a number of important documents and credit cards. We vowed then to be more careful and check our wallets and passes before leaving any Muni bus we happen to be on. 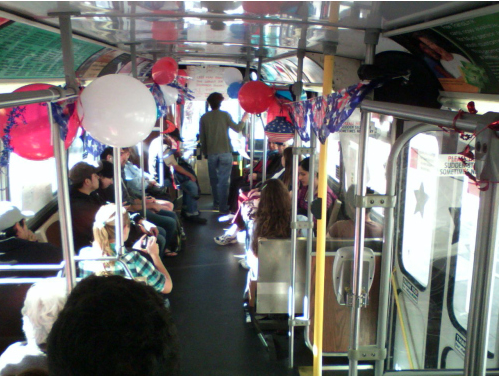 A few days later we boarded a #5 bus on Market Street to get back up into our area, and Bernetta was the driver. I didn’t recognize her at first, but she recognized us and said, “Hey, you got your pass back!” She went on to tell us how glad she was it had worked out and that she’d actually been worried about it! 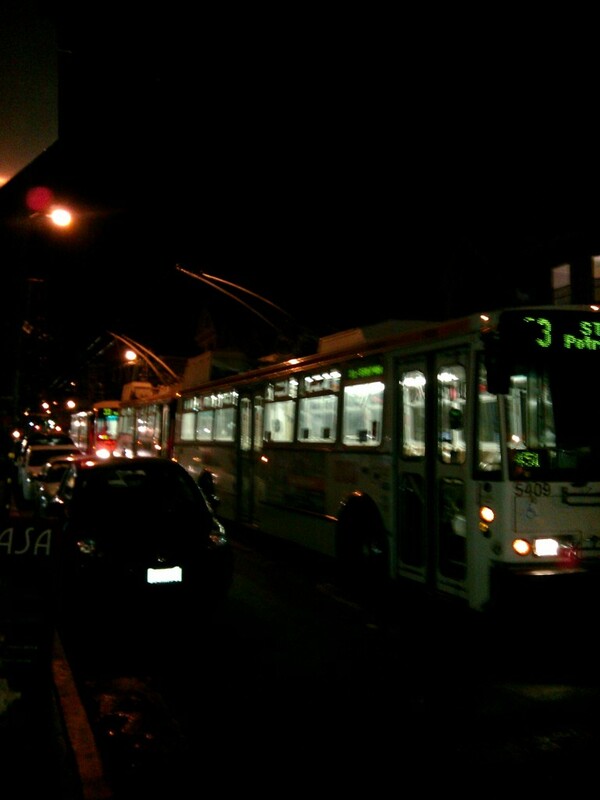 So I’d like to commend two Muni drivers who care – George and Bernetta. To narrow it down because I know there are quite a few drivers, George was driving the #33 route and Bernetta was driving the #5, both on the evening of March 2nd. We’d also like to extend thanks to the phone operator who took our request for assistance that evening, even though we don’t know her name. She was very kind and helpful. Update (9:14 a.m., Friday morning): Rider Dawn sent us this photo of a legion of 33-Stanyans backed-up after the accident described below. Photo taken by the unstoppable @laurao of @caltraindiaries fame. Taken near Noe and 18th Street. Update (4:43 p.m.): MTA says that the area of the accident is clear, and the 33-Stanyan has returned to its regular route. The injured pedestrian is in serious condition, according to San Francisco General Hospital. As of 2:43 p.m., Muni service on the 33 Stanyan route has been disrupted by an accident involving a bus and a pedestrian on Stanyan near Fulton. Buses are being re-routed around the intersection. According to the San Francisco Fire Department, the pedestrian has been transported to San Francisco General Hospital with potentially life threatening injuries. 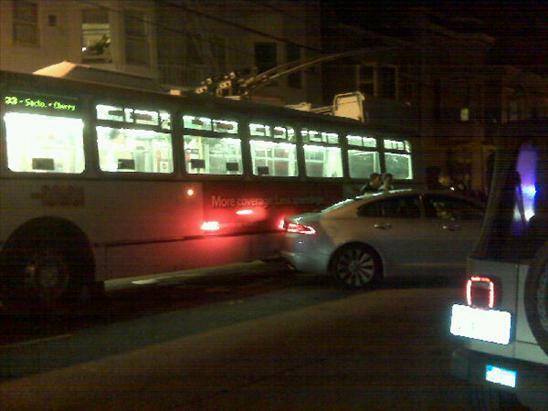 According to initial reports from the San Francisco Police Department, the accident occurred when the southbound 33 Stanyan bus began to pull away from the bus zone. Again according to initial information, a male pedestrian running for the bus in an attempt to board it fell and slid under the bus and was run over by the rear wheel. Initial reports indicate that the pedestrian’s leg was injured.